Perfect for training at home – the ALU training course set offers everything you need to get started. The side parts are manufactured of white or ­coloured powder-coated aluminium and fitted with an attached PVC keyhole rail. The training course is also available with a metal keyhole rail (price on request). The quarter cut timber poles have an opaque paint finish and protective caps on the two ends of the pole. 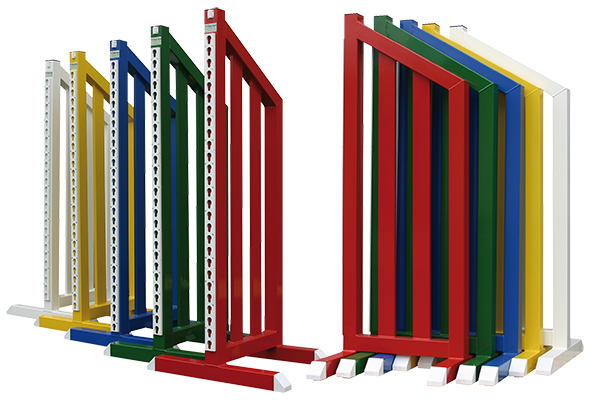 Side parts, ­gates, planks, as well as fillers are available in the colours shown. The cups are delivered with aluminium feet. Extension of the compact set is easily ­possible: All elements can be purchased individually. Product information in this regard is provided on the next pages. Optionally the training course is also available with alu training wings in other standard RAL colours on request.